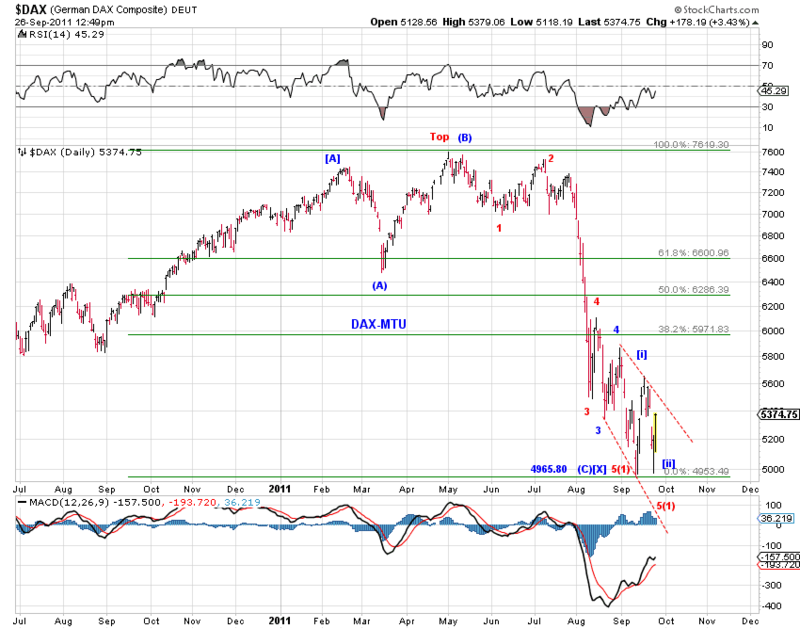 (blue)- corrective count potentially complete. 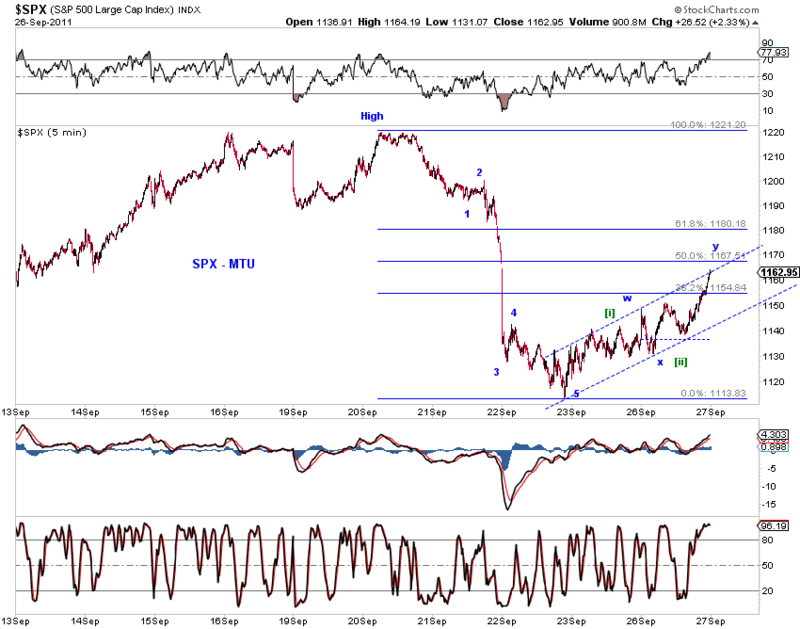 The primary count of a corrective retrace still tracks well. 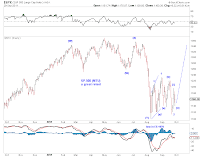 Chart 1 (SPX) and Chart 2 (INDU) show the squiggle count. 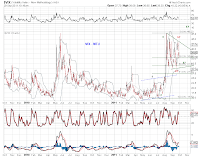 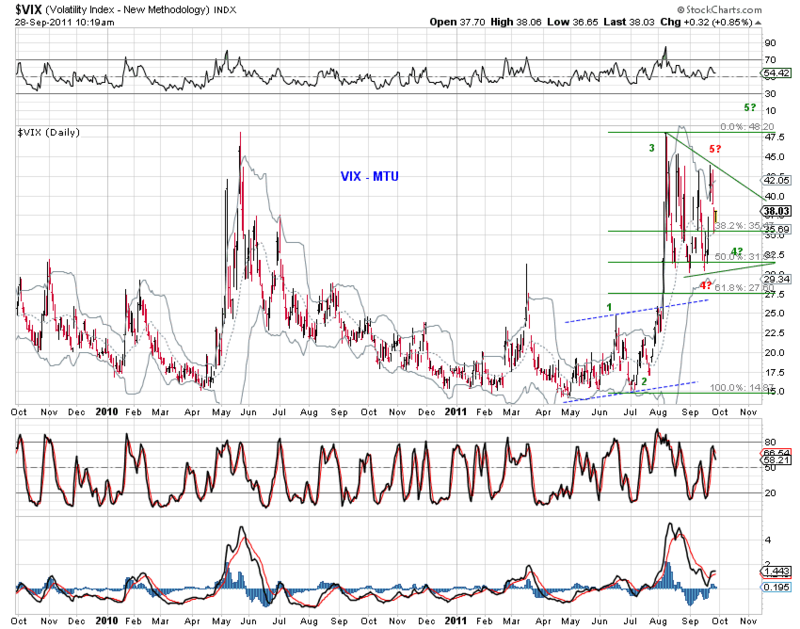 Chart 3 and Chart 4 refresh the primary bullish and bearish count. 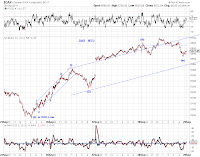 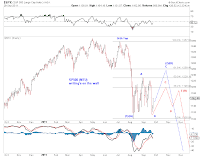 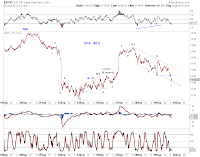 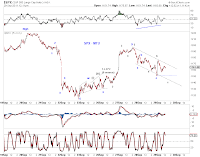 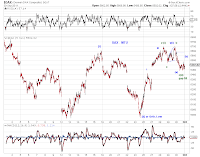 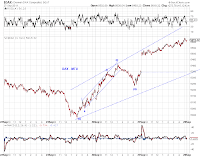 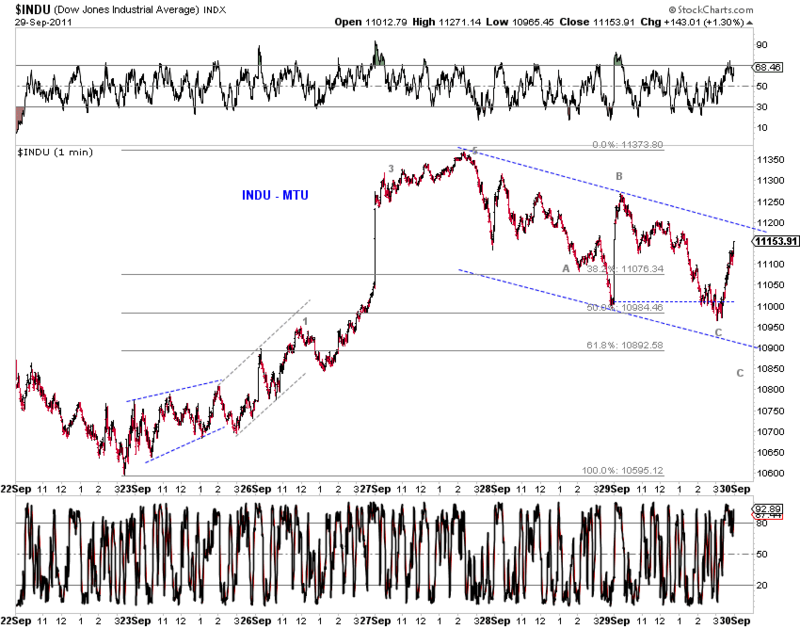 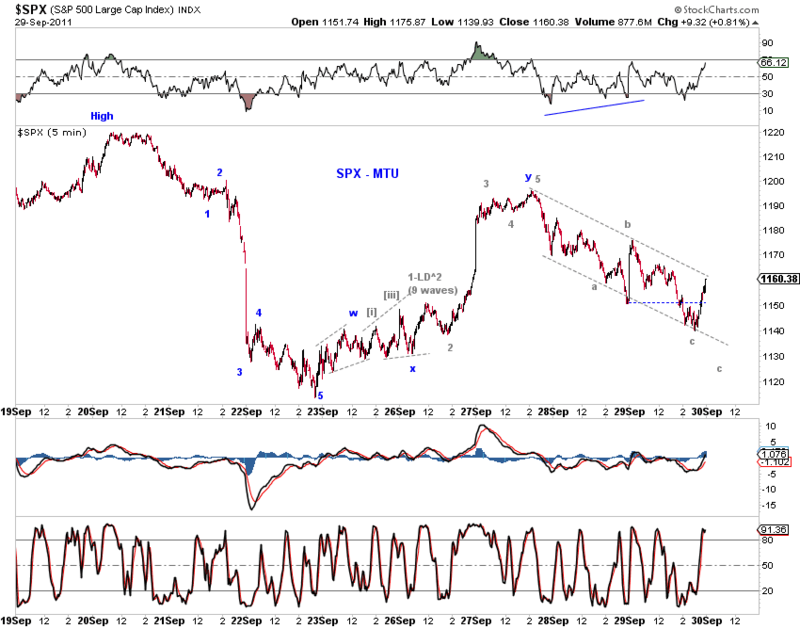 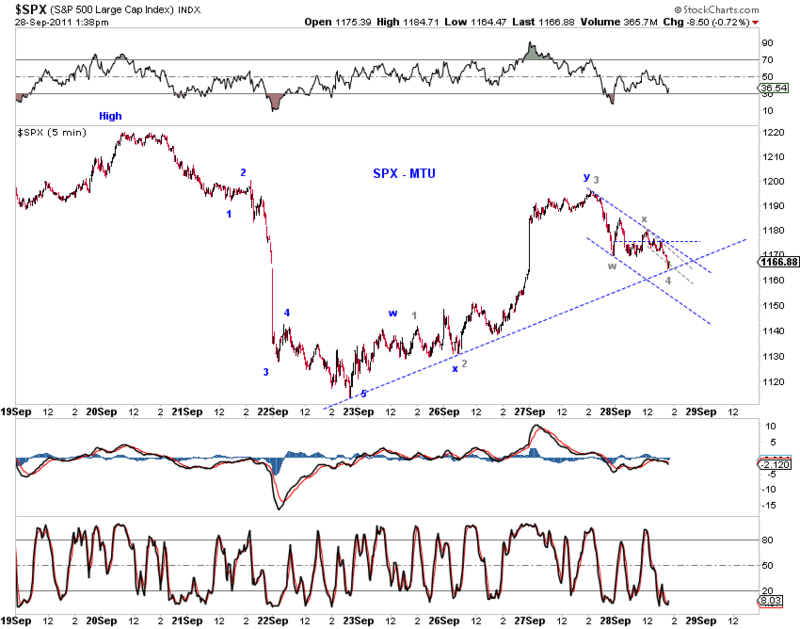 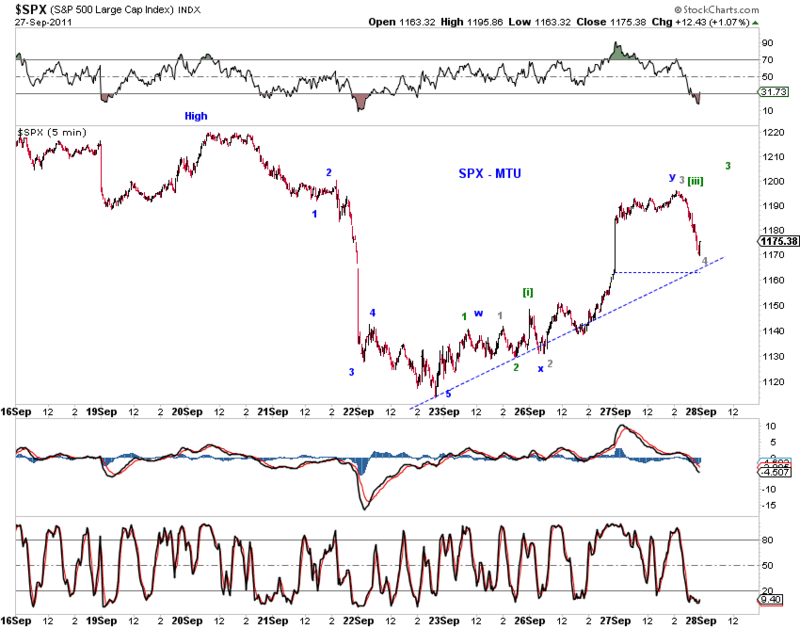 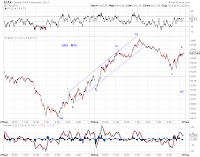 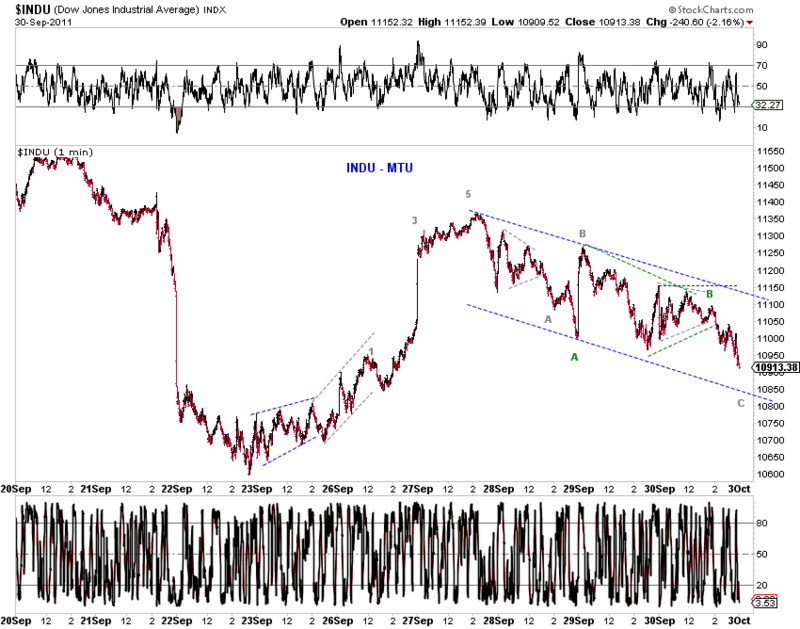 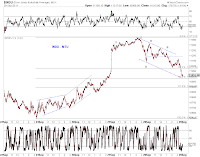 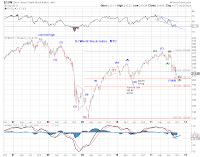 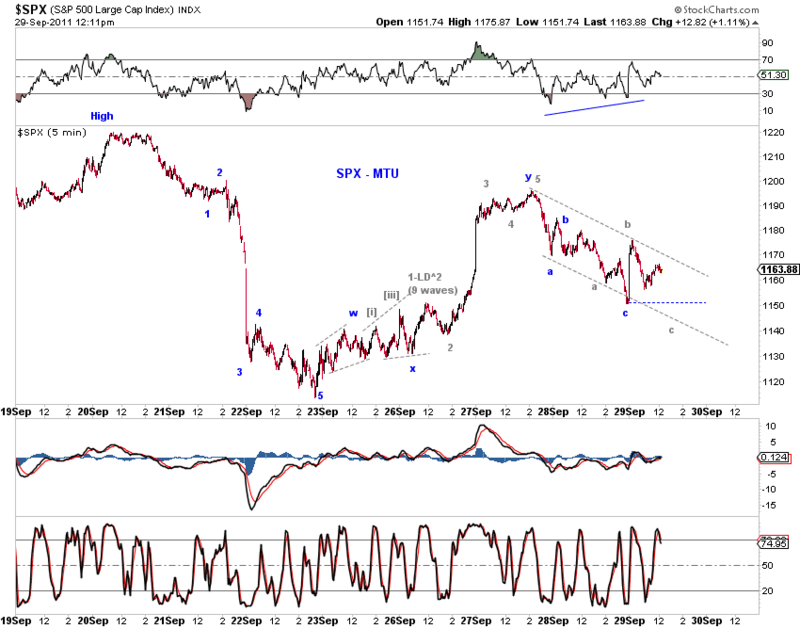 Chart 5 shows how NDX can fit into the larger count - a wave 2 retrace of an LD under the bullish interpretation, which is Chart 3 in Twist and Turn (9/23/11) (see the 2nd chart below). 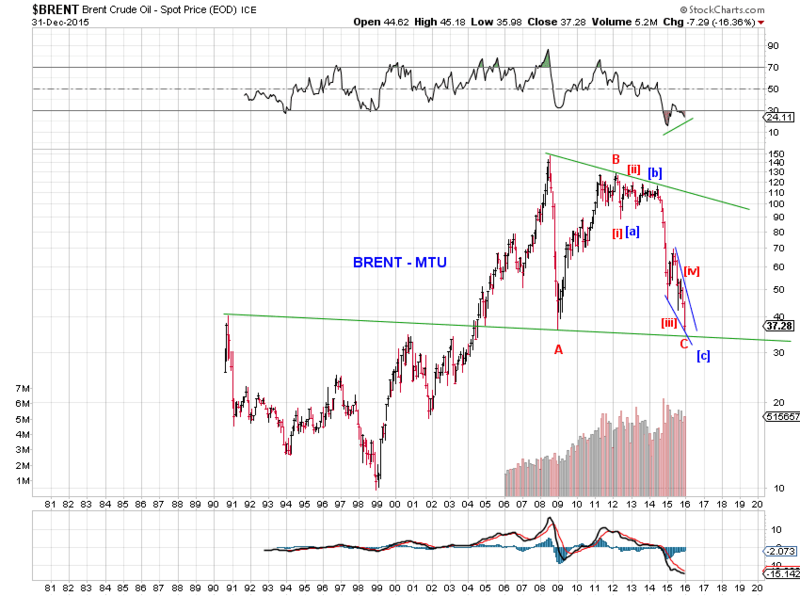 First, some technical specifics. 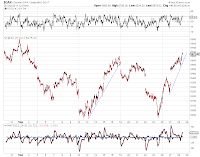 There's is a valid way to count a five-up from the recent low to yesterday's high (in cash as well as in futures), albeit a bit forced. 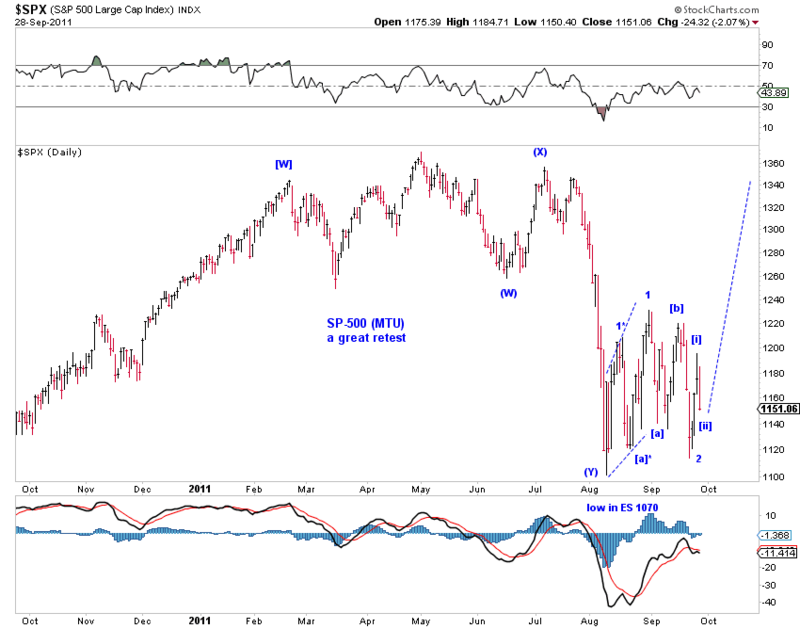 The implication is that all three proposed top primary counts (1 bullish, 2 bearish,see below) survive. Chart 1 (SPX) and Chart 2 (INDU) present the squiggle count. 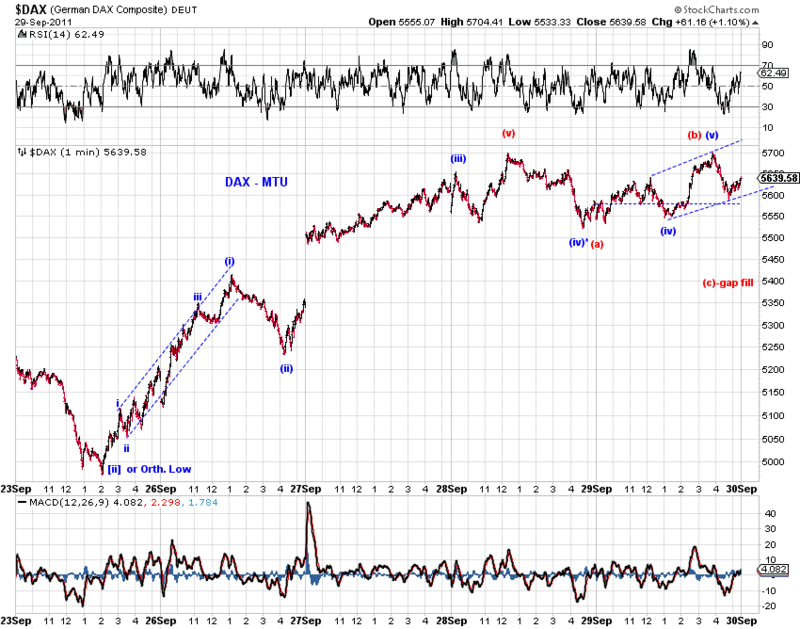 (gray) five-up, with a LD wave 1 whose wave [i] is also an LD - LD-squared. 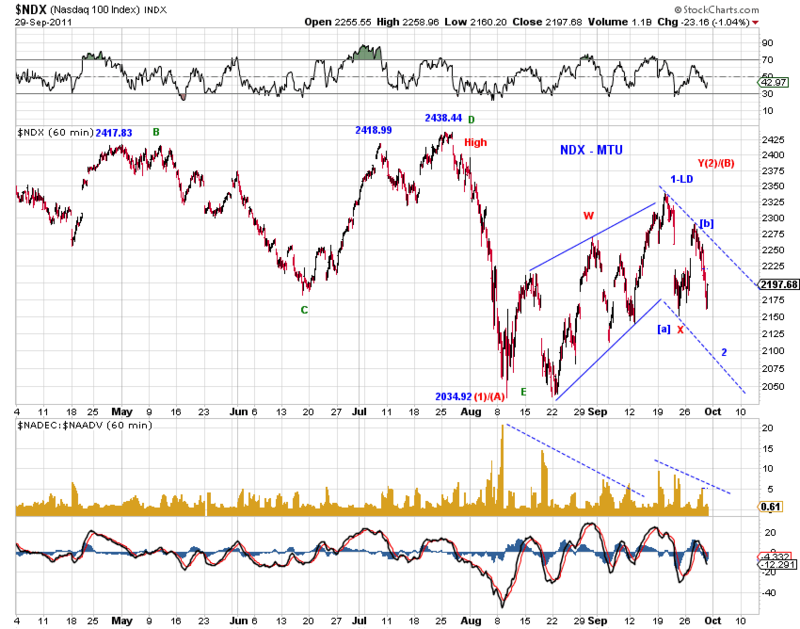 The proposed gray five-up count is more obvious in INDU. 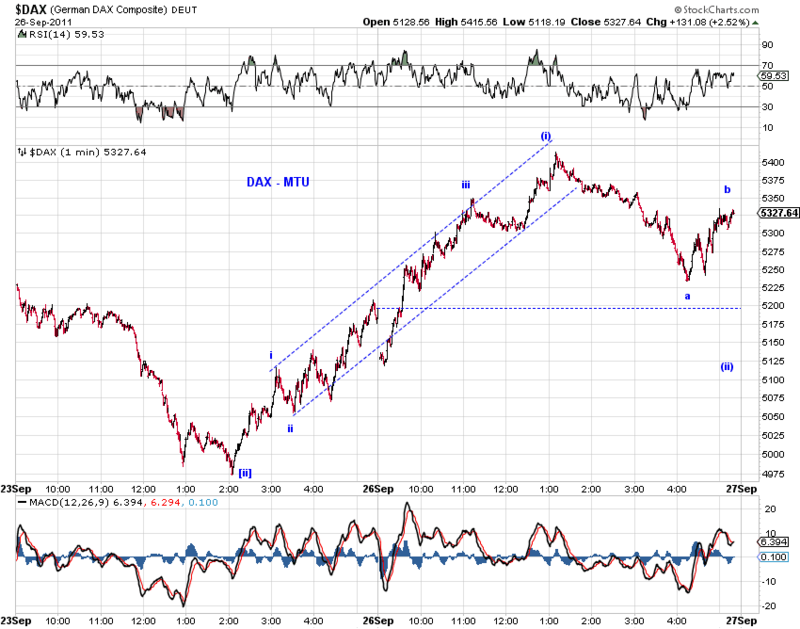 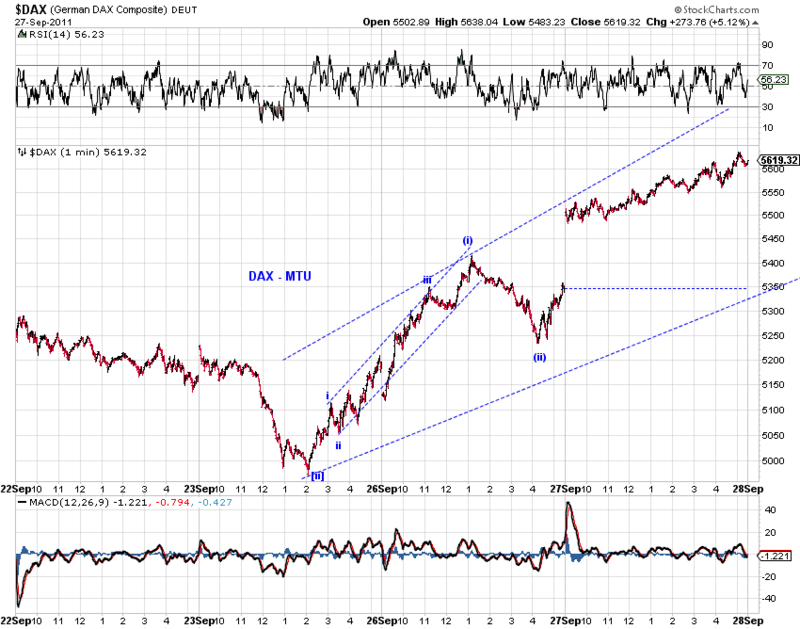 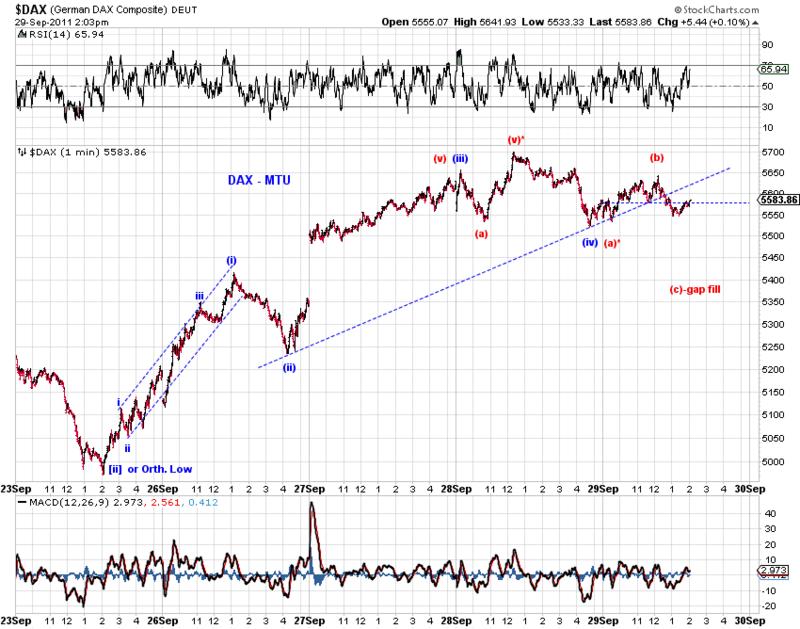 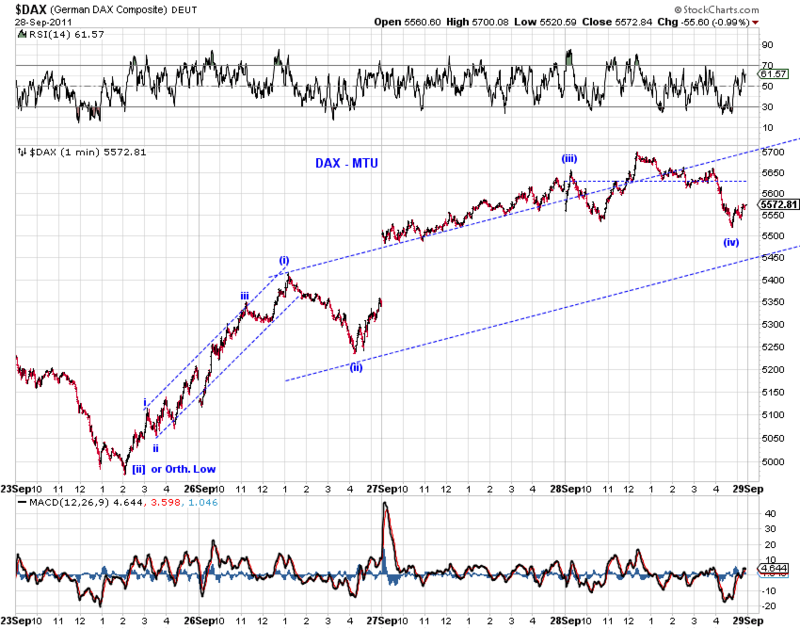 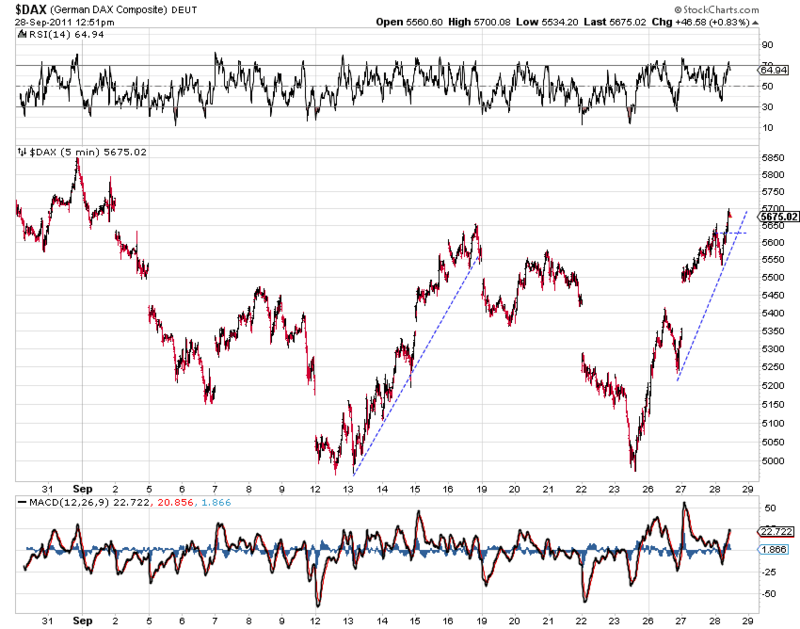 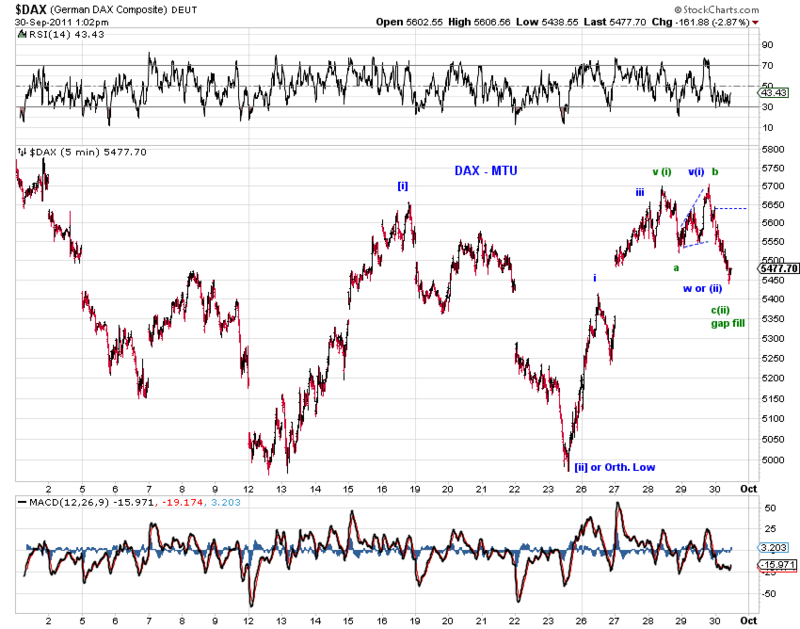 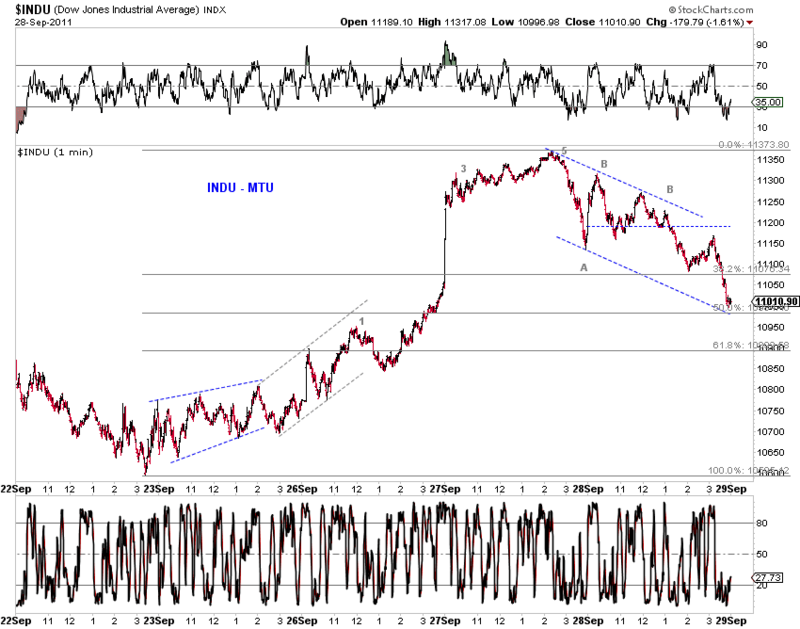 Note also the overlapping waves in INDU during the sell-off. 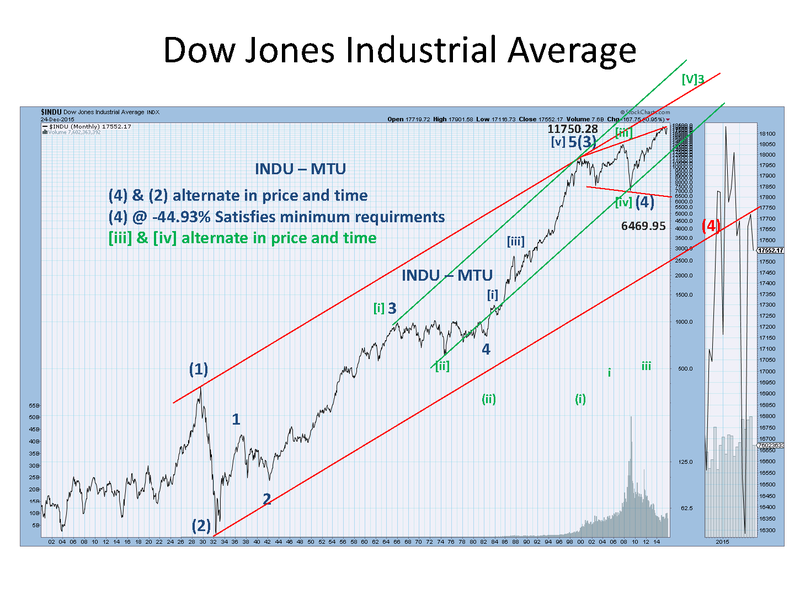 Given the above , the top primary counts are shown in Chart 3 and Chart 4. 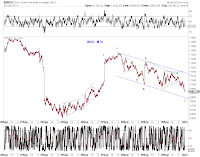 See Twist and Turn (9/23/11) for discussion. 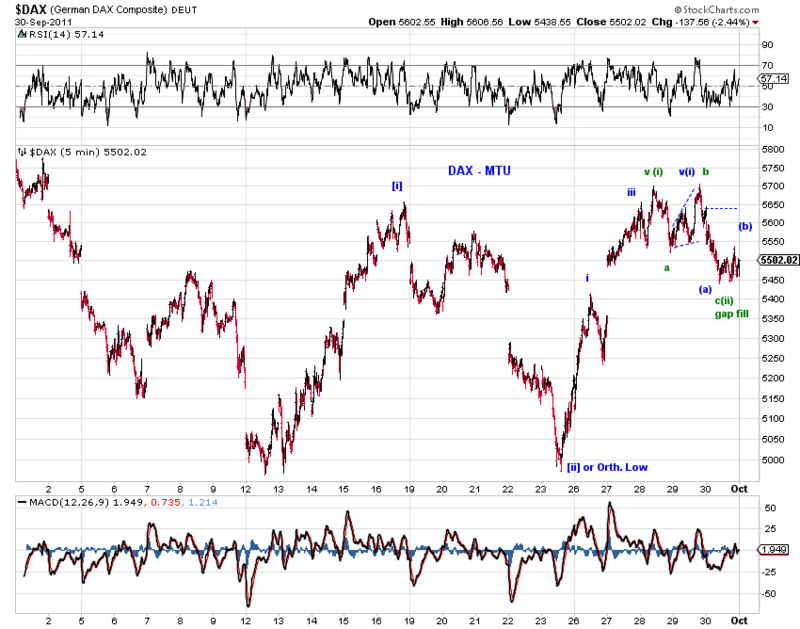 A look at how DAX closed, appears to be missing a wave 5-up. 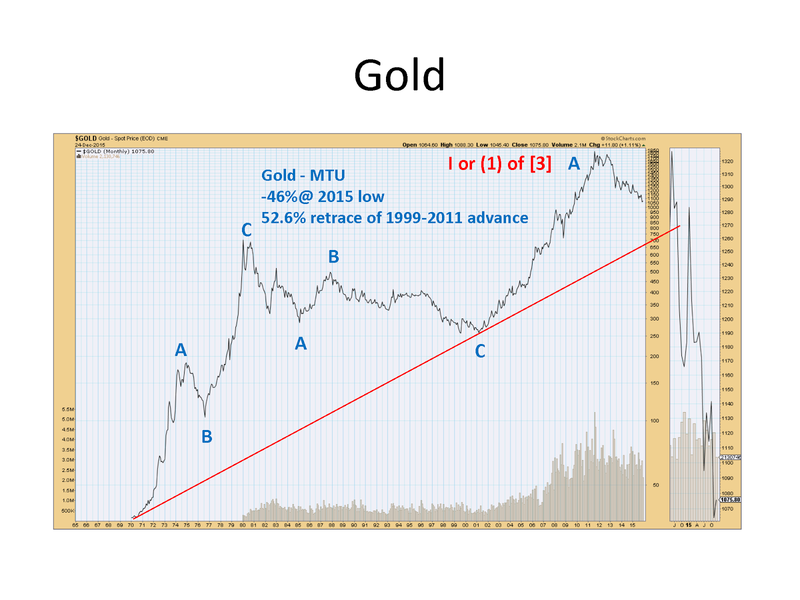 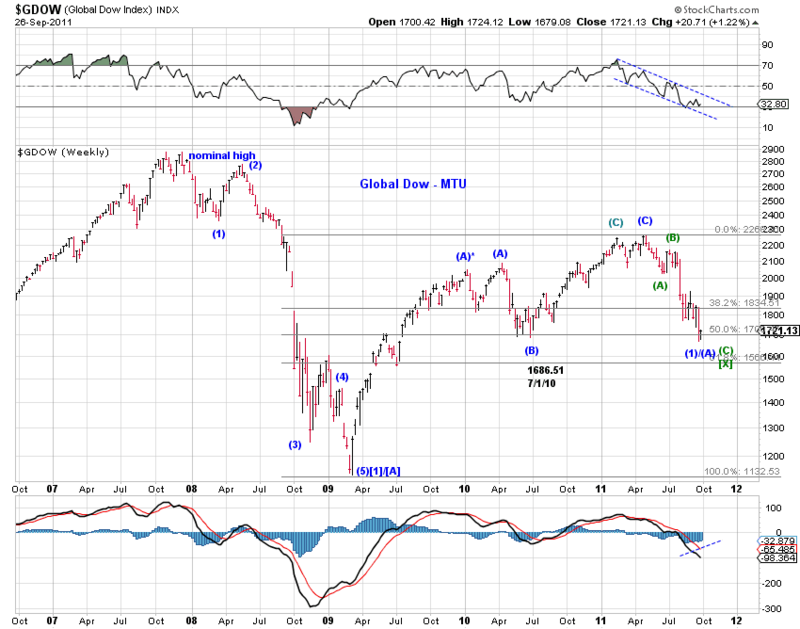 See 2nd chart below. 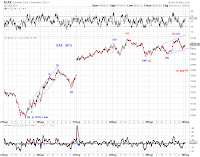 Truncated 5 or triangle-like 4? 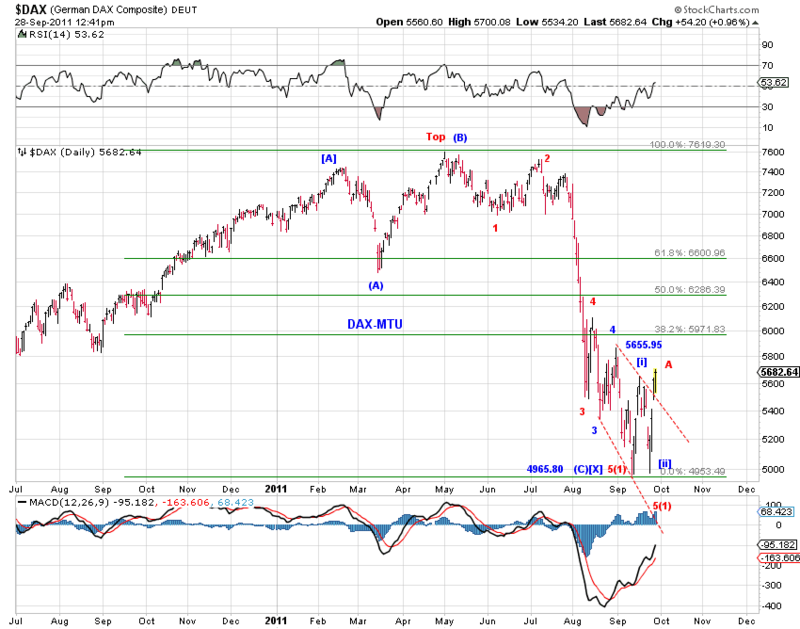 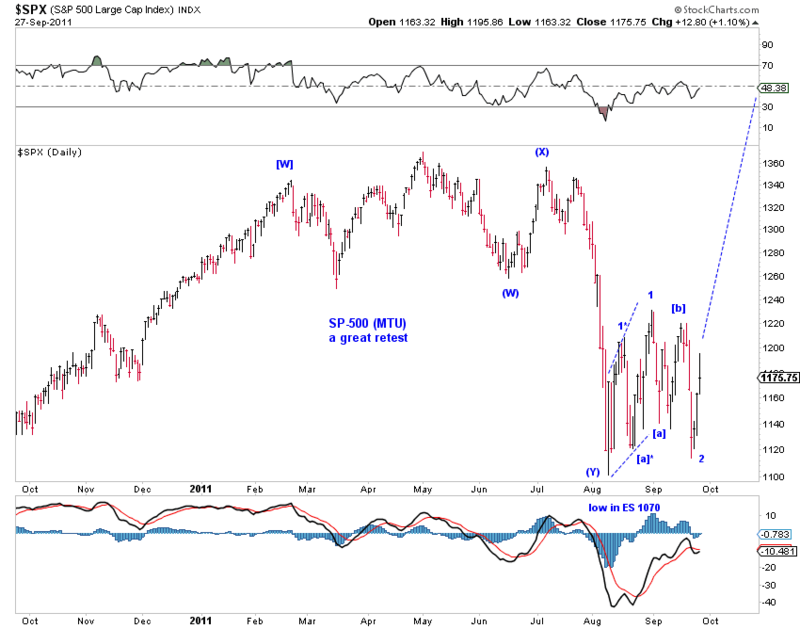 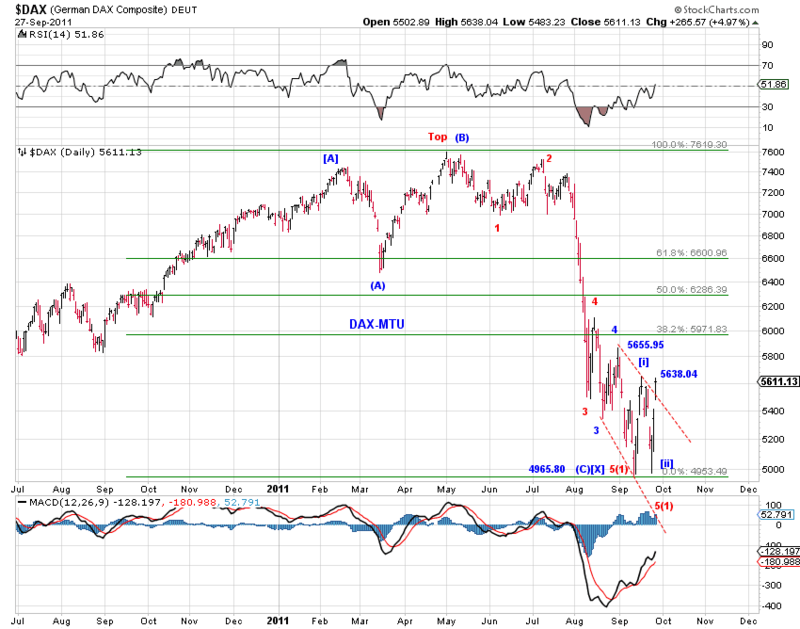 First the primary bullish and bearish counts again - see Twist and Turn (9/23/11) for discussion. 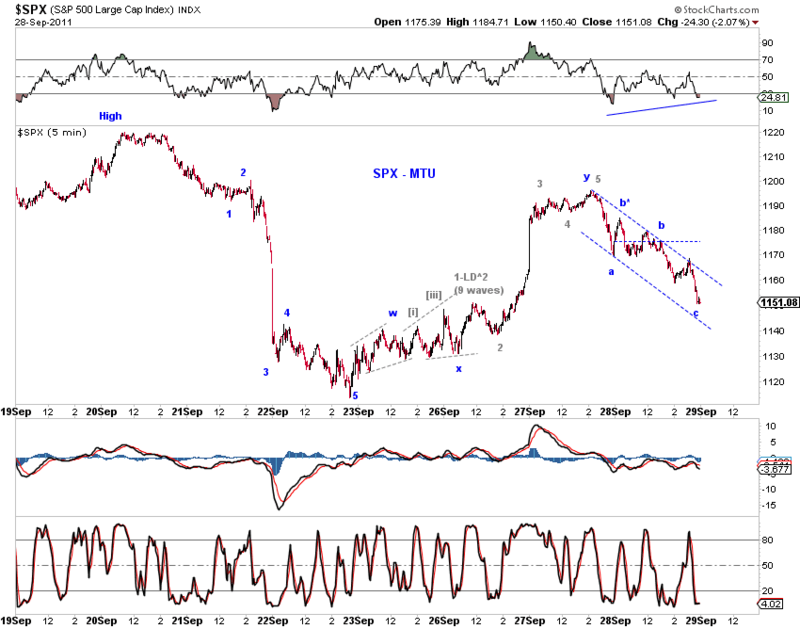 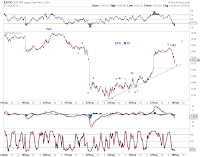 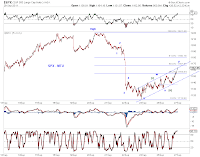 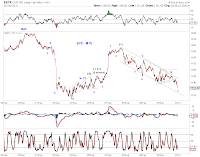 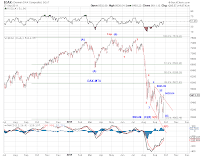 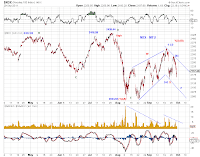 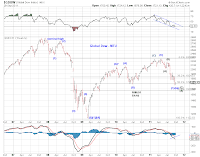 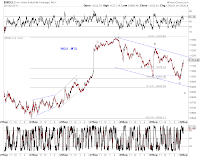 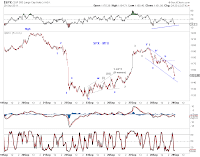 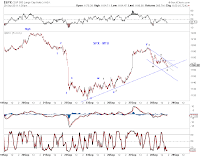 Note that a corrective rebound from the recent low does not necessarily lead to an immediate lower low as the triangle wave (B) in the bearish count (Chart 2) accommodates. 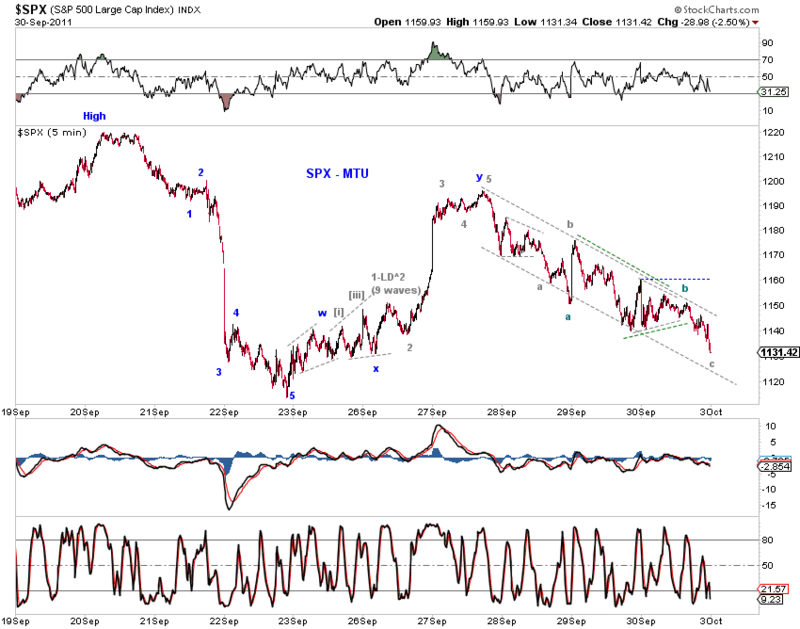 Chart 3 (ES) and Chart 4 (SPX) show the squiggles. (black-ES, green-SPX) impulse up, wave [iv]-down of 3-up likely completed at around the 0.382 fib retrace in the form of a zigzag. 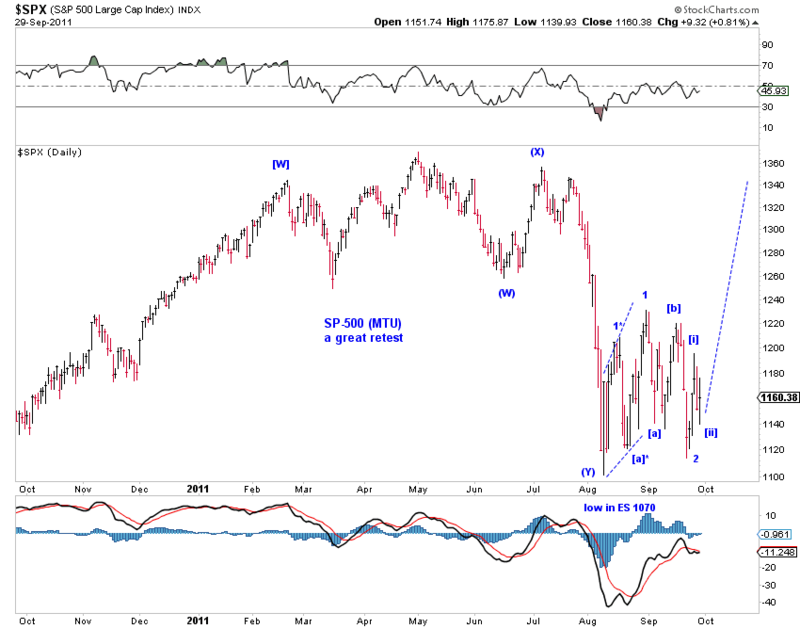 (gray-SPX) impulse up, looks more proportional w/o the overnight data in ES. 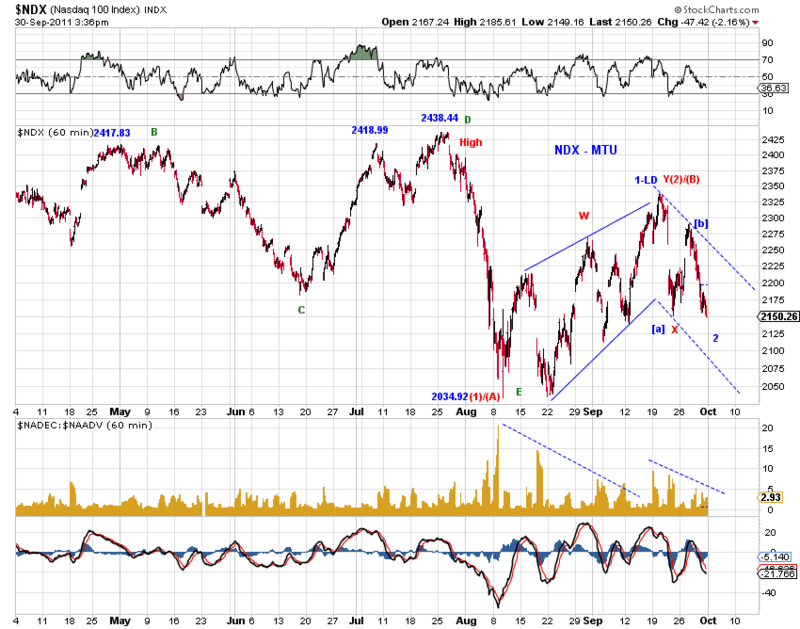 [iv]-down of 3-up in progress on impulse up, trend change on corrective count. ES - retracing 0.618 of the prior sell-off at the moment, impulse up or double zigzag, see the weekend commentary and Monday's EOD update for discussions on the larger counts. 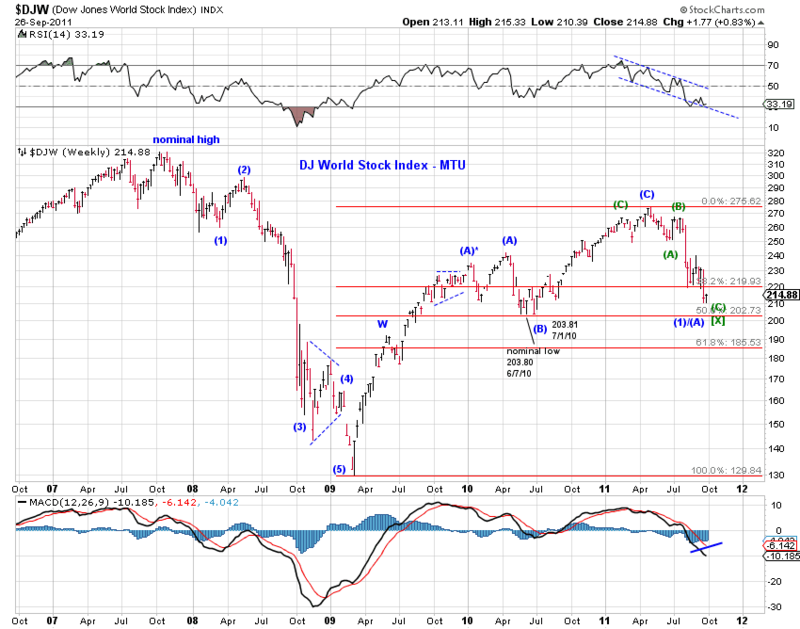 Top tracking counts on the Global Dow and the DJ World Stock Index. 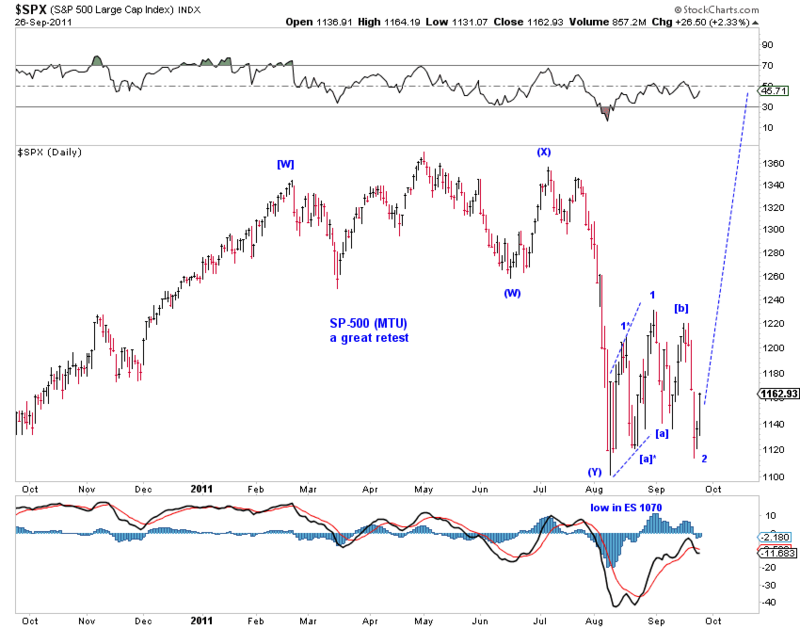 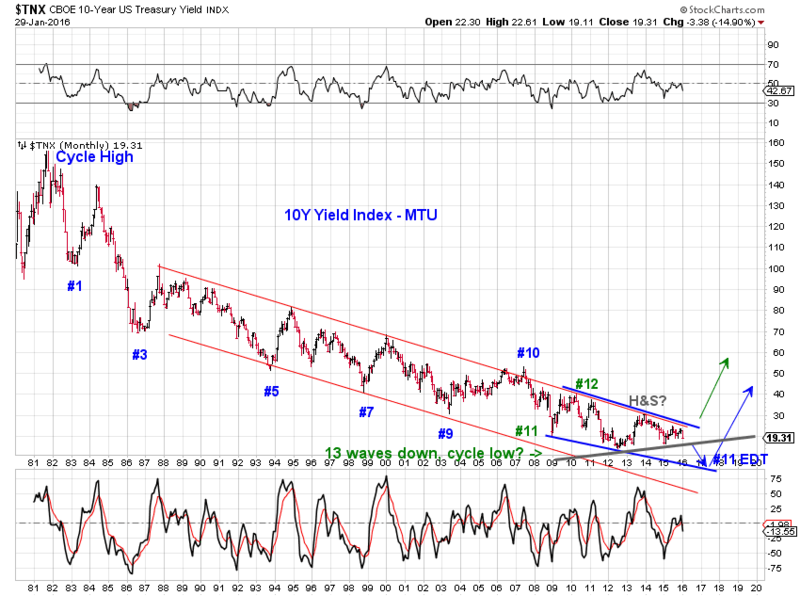 They are not meant to overstate the bullish or the bearish case, but highlight probable courses at the moment. 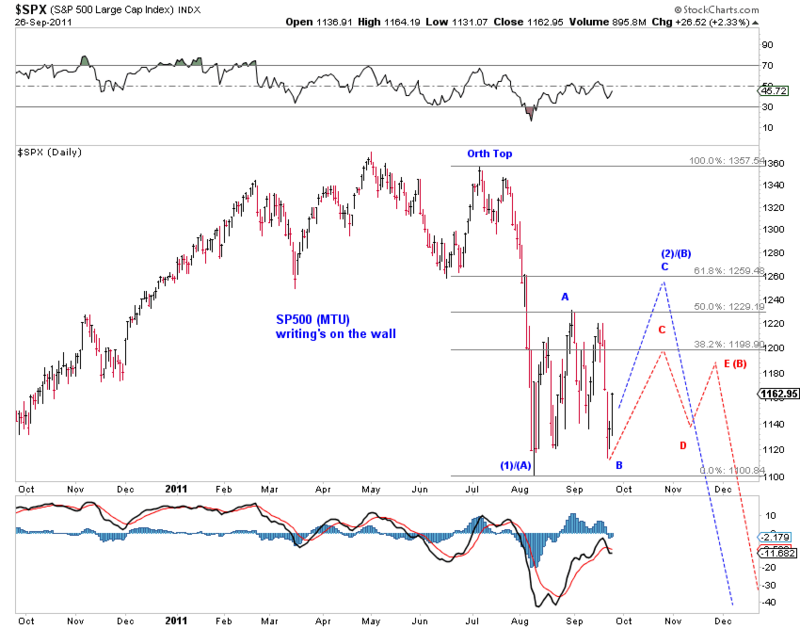 Chart 1 and Chart2 update the primary bullish and bearish counts discussed in Twist and Turn (9/23/11). 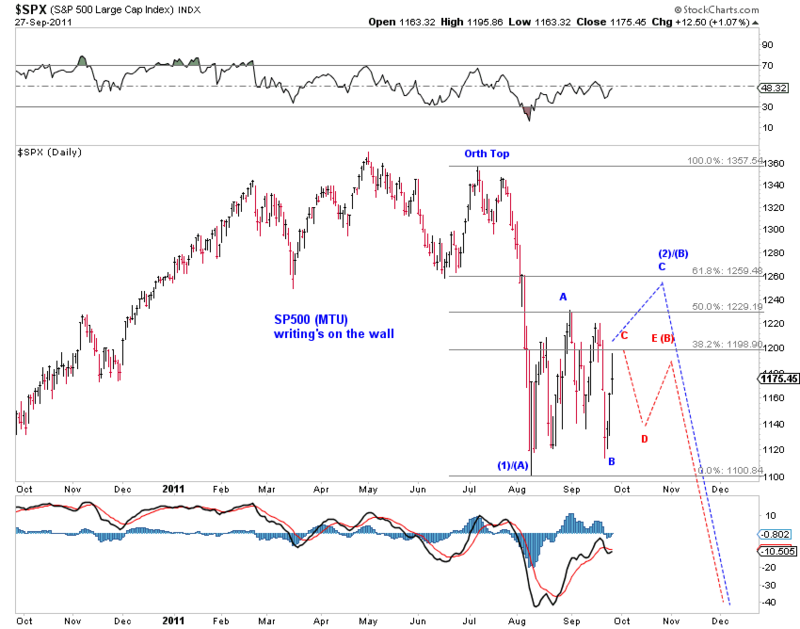 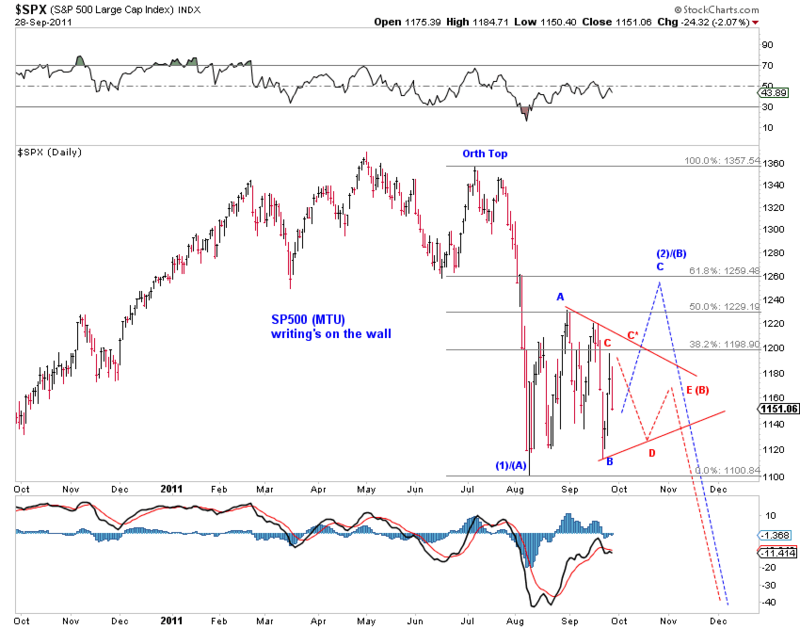 Chart 3 presents the tracking squiggle counts from the recent low.